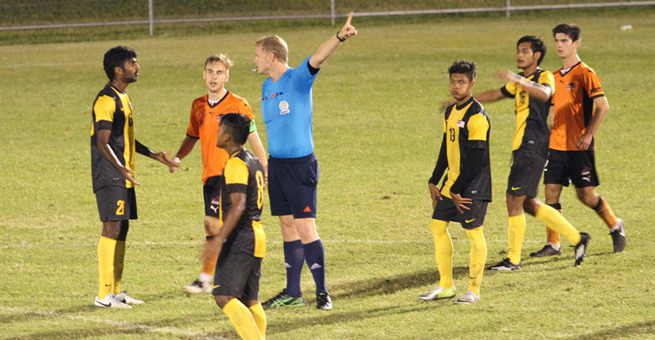 Brisbane Roar NYL held off a strong challenge from Harimau Muda at Perry Park on Wednesday night, defeating the Malaysian side 3-2 to record their third straight victory in NPL Queensland. A frantic start to the rescheduled round one fixture saw three goals in the opening twenty-five minutes but the match provided end-to-end action throughout as both sides flexed their muscle in front of goal. The spectators at Perry Park had barely taken their seats before the visitors took the lead as striker Muhamad Faizat Mohamed Ghazli scored from a tap-in. The early action wasn’t over as the Roar Youth travelled up the other end almost instantly and scored twice - Jai Ingham with both goals to put his side 2-1 up after just six minutes. Mohamad Qhazli went close to his second after 20 minutes after a well-placed cross from Nazirul Naim Che Hisham, but his powerful header flew just high of Fraser Chalmers’ crossbar. Brisbane extended their lead through a set piece not long after, lively Ingham doing well to pick out the head of defender Lachlan Jackson to head home inside the six yard box. The start to the second half was much less frenetic but the intent was clear from both sides as each team tried to outpace the other. Chalmers pulled off a strong save when one-on-one with Saarvindran Devandrn ten minutes into the second period while Ingham went close with a couple of efforts at the other end, including his own one-on-one with the Malaysia ‘keeper Mohd Farhan Abu Bakar that he put wide. 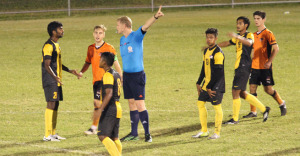 The action-packed night continued as Harimau Madu went down to ten men in the 70th minute, substitute Kenny Pallraj Davaragi sent off by referee Ashley Stout for a nasty tackle in the middle of the park. Despite their numerical disadvantage, Ong Kim Swee’s men pulled a goal back eight minutes later through Devanorn although Brisbane Roar held on to secure the vital three points.